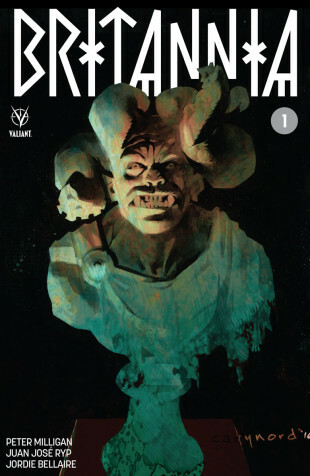 The Fellowship was fortunate enough to obtain a copy of BRITANNIA #1 from Valiant Entertainment. Peter Milligan writes, Juan Jose Ryp draws, Jordie Bellaire colors, and Dave Sharpe letters. Roman Centurion Antonius is asked by the Great Vestal to go AWOL to save one of her priestesses from some sort of horror. His mind is broken, but her temple nurses him back to health and trains him in the art of psychology. Which is good, because the emperor doesn’t react well to the AWOL part. Now a mystery has arisen in Britannia, and Nero sees his chance to get rid of the now annoying “detectioner.” But someone else has plans as well. Antonius is a man of many talents, and now he’s being crafted into something more. He’s also a character of many layers, each one more human than the next. He’ll likely need that humanity before he’s done, too. This story is equals parts detective story and conspiracy yarn, and it does a wonderful job of drawing the reader in. And the art is really beautiful, equally at home with civilized Rome and the horrors of the wild. If Valiant wanted a story to lead them into a new age, this is a delightful choice. There’s a lot of cool pieces to this story to appeal to a wide audience, so go check it out. BRITANNIA #1 is available now at your FLCS or at valiantuniverse.com.